3. Test oil with one ball. The oil should bubble when potato is in oil and ball should take about 1-2 minutes to brown and cook through. (If takes longer the oil needs to be hotter, if it browned too quickly on the outside and the inside is still cold, the temperature needs to be lower.) 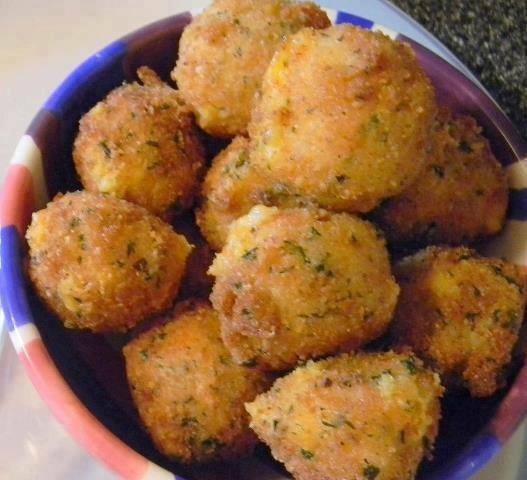 Once oil is ready, add potato balls in small batches and fry for 1-2 minutes – it will depend on size. Remove with slotted spoon and place on paper lined plate to allow excess oil to drain off. Repeat until done. 4. Allow to cool for a minute or two and serve with dipping sauce.